I suppose the title needs a little explanation. I mean, what is a Ping Pong Door? Is it a door that plays ping pong? That would be odd, but I suppose if that a door opened at the right time could hit return a serve. 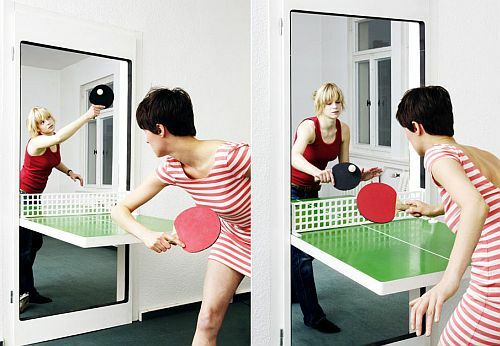 Perhaps a better term for it would be Ping Pong Table Door, because that is essentially what it is, a door that can transform into a ping pong table. Okay, maybe transform isn’t the word, especially after that really cool Transformers movie. All the Ping Pong table do is fold down, but this simple thing is enough to make it very cool. After all, many of us may not have enough space in a single room for a ping pong table, but we might have that between two rooms. That may limit play time due to the doorframe, but it might give it an interesting element of play as well. It might be better than Wii Table Tennis. The change can happen in just seconds, which means all you need to do is add on the net and you’re ready to paddle! I’m wondering if you can fold it half way up so you can play solo with multiple balls, like Forrest Gump. I’m also wondering if the green pattern is going to be a permanent part of your door, resulting in some serious damaged décor. So far, this Ping Pong Table is only in the design stage, but I have heard that the Ping Pong Table could be out as early as next year.